People used to pick their bank based on convenience, choosing a branch that was close to home or to their place of work. But increasingly, people are opting for the even greater convenience of their personal computer. And they may be gaining additional benefits as well. You can bank online through a bank that also has physical buildings, or you can choose a bank that exists only online. Depending on the bank, you can do the same kinds of things you can do in your branch – open a checking account or savings accounts, pay bills, make deposits and withdrawals, even apply for loans. But often you will get a better deal – sometimes significantly -- if you click than you would if you walked into the bank. That’s because online banking is much less costly for the banks, and they often pass that savings onto customers in the form of better rates and fewer fees. The major, established banks usually offer extensive online options. If you are already a customer of a large national bank, you may find that if you open an account online, you will get a higher interest rate than if you open an account in your branch. You also probably will be able to pay bills, check balances and make transfers without ever leaving your computer. But there are also banks that exist only online, and they offer some of the best deals. Although these “virtual banks” exist entirely online, they offer the same kinds of services you are used to in traditional banks. For example, you can open a checking account. Most of the bills you used to pay by writing a check and mailing it are paid online, but if you need a physical check, the bank will write one and send it out on your behalf. Increasingly, financial services firms such as Charles Schwab and ING also offer online banking options that operate just like those in a more traditional bank. In addition to more favorable rates and terms and lower fees, online banks offer greater convenience. They are open 24/7, and because they are not actually located anywhere, they are, in a virtual sense, located everywhere. You don’t have to close an account in one city and open an account in another when you move, for example. There are some potential drawbacks, too. For example, while most online-only banks provide an ATM card, they don’t have ATM machines of their own. You have to use some other bank’s machine, which usually means you have to pay a fee. But some online banks will refund those fees, so check with the bank. Also, you may not have the immediate access to your money that you can have in a traditional bank, where you can walk in, make a withdrawal and walk out with the cash in hand. An online bank will have to send you your check, although some can transfer funds into a linked account that you can access immediately. If you are considering an online bank, do a little homework first. Make sure that the online bank, like a more traditional bank, has FDIC insurance to protect depositors. 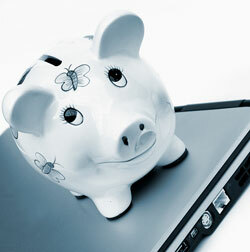 Check out which online bank offers the best deal on the banking services you need.